This electronic publication was conceived in the summer of 1992. A small band of Cornell Law students, charged with identifying subjects on which computer-based materials would be particularly helpful, placed citation at the top of the list. 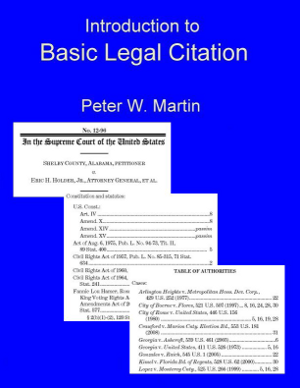 With their assistance I prepared the first edition of Introduction to Basic Legal Citation. It was released on diskette that fall, one of the first hypertext publications of Cornell's Legal Information Institute (LII). Later reconfigured for the Web, where it still resides at: http://www.law.cornell.edu/citation/, the work has been updated regularly in the years since. Like that online version on which it is based, this e-book was most recently revised in the fall of 2013. As has been true of all editions released since 2010, it is indexed to the fourth edition of the ALWD Citation Manual and the nineteenth edition of The Bluebook. But it also rests firmly on the evolving practice of judges writing opinions and lawyers writing briefs. Professor Martin requests that you donate to the Legal Information Institute at Cornell Law if you would like to show your support for this free work.